Our best seller exclusive Italy honeymoon. Through the beauty of the eternal city and the breathtaking landscapes of the sunny Amalfi Coast: the quintessence of a Romantic Honeymoon in Italy. 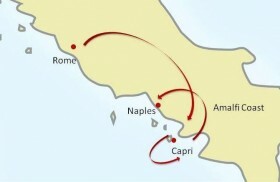 The tour features Rome, Pompeii, Sorrento, Positano, Amalfi, Ravello and Capri. Enjoy “Your Roman Holiday” with a fun escorted Vespa Tour. Admire one of the most beautiful churches and museums in the world at the Vatican and explore the ancient Roman ruins of the Colosseum by night! Get stunned along the breathtaking scenic Amalfi Drive and a unique walk in the Path of Gods. Have a gorgeous dinner in the infinity terrace in Ravello admiring sunset on the breathtaking Amalfi Coast! Enjoy the “Dolce Vita” sitting in a lovely cafè at the famous “Piazzetta” in Capri… The romantic private boat Tour to Capri will make this beautiful honeymoon truly unforgettable! 9 Nights accommodation in exclusive and fascinating 4 stars sup. 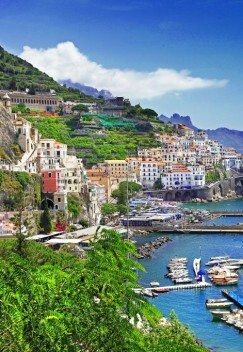 Hotels, with full buffet breakfasts: 3 Nights in Rome, 4 Nights in Positano, 2 Nights in Capri. Welcome Honeymoon Package at your arrival in each hotel. Private sightseeing Tours with expert local English speaking Guides in Rome (Colosseum by night, Roman Forum, Vatican Museums and Sistine Chapel) and Pompeii; including all the entrance fees to the sites visited avoiding long waiting lines. Full Day private Excursion along the Amalfi Coast with professional English speaking local driver Guide. Hiking Excursion with a local experienced English speaking Guide along the breathtaking “Path of Gods”. Full Day private Boat Tour of Capri Island. 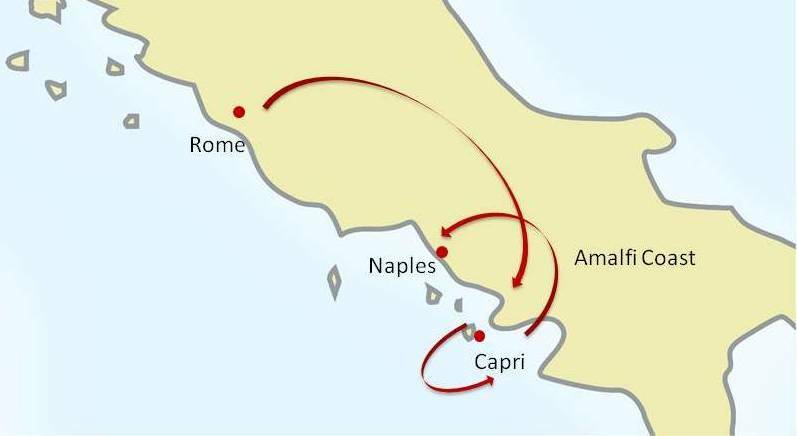 High Speed Train Rome – Naples: 1st class tickets and seats reservation. All private transfers by deluxe van with English speaking driver, available for transfers and excursions for the entire Tour (including airport/train stations transfers). Enjoy the Roman life and admire the Eternal City highlights: Trevi Fountain, Piazza di Spagna and Spanish Steps, Via del Corso, Piazza Navona, Campo dei Fiori, Pantheon, Imperial Fora and a visit of Colosseum by night. Visit one of the most beautiful churches and museums in the world: the St. Peter’s Cathedral, Vatican Museums and Sistine Chapel with the incredible Bernini Dome and the Michelangelo’s Pietà. A local private Guide will take you through the archaeological site of Pompeii to admire the ancient Temples, the Thermal baths, the Market, the majestic Theatre and the beautiful houses of the Roman aristocrats and learn how life was before the eruption of Mount Vesuvius in 79 A.D. Enjoy the sun and sea and relax in the Amalfi Coast. Private Excursion along the breathtaking scenic Amalfi Drive. Amongst the colors and scents of this incredible land, visit Amalfi, Ravello and Sorrento. Stop in beautiful little beaches for a bath or in the most breathtaking view points for your pictures. Hiking Excursion with a local experienced Guide along the Path of Gods, through the very unique wild Mediterranean bush, coastal forests and caves suspended between sky and deep blue sea. Full Day Boat excursion with private boat, captain and guide to the island in the gulf of Naples much loved by intellectuals, artists and writers, all captured by its magical beauty. Stunned by the beauty of the landscape, admire the Faraglioni, the incredible via Krupp, walk around the lovely streets of the village.